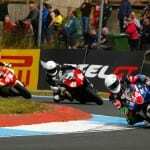 After a month’s rest (and secret testing for some riders), the Ducati TriOptions Cup joined the British Superbike Championship at sunny Knockhill. And it was actually sunny for most of the weekend – the sheep stayed on the hill. It was all about one man: Dennis Hobbs. Hobbs, the former British Championship front-runner, now resides in Scotland and works at the circuit as a commentator, instructor, security guard and occasional groundsman. He grabbed pole position onboard the P&H Motorcyles/Carl Cox by half a second from Marty Nutt (JHP) and guest rider, Paul McClung. 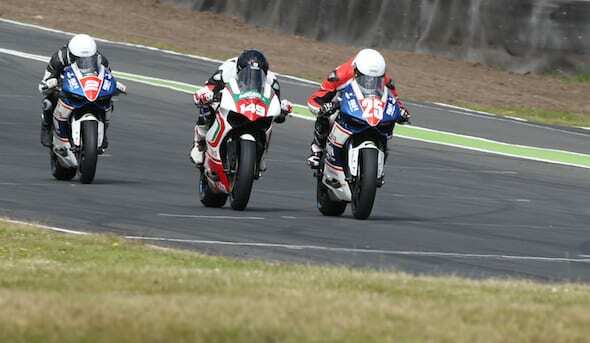 Local lad, McClung occupied the Ducati VIP bike and was recommended by Niall Mackenzie. Before the event, Spuds said: “In my role as KMSC President, l’ve seen the progress Paul has made over the past five years. As a Club, the KMSC are always looking at ways to support up and coming young talent and l’m delighted that l was able to help Paul with this opportunity. 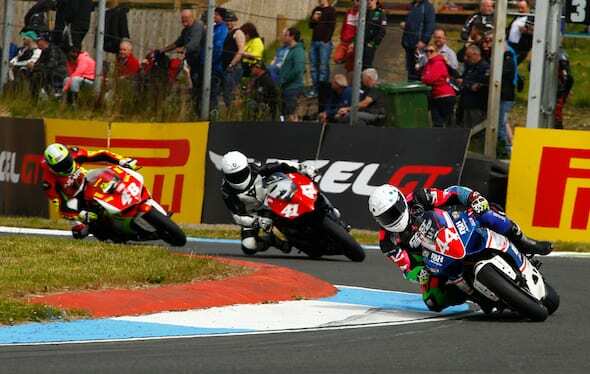 Having a Scottish rider in the high profile Ducati Trioptions Cup will be a great addition to the Knockhill BSB weekend so I hope Paul has two successful races.” Fair play, we say. Championship leader and my other P&H teammate, Leon Morris headed up the second row in 4th place. I ended up a disappointing 12th place after a clutch problem reduced free practice to five laps. The rain was threatening to come for the first race but never did, and the track was drying from a morning shower. Dennis Hobbs took off at the front and was rarely troubled. Little Legs was a second or so behind, and then came the cavalry led by Marty Nutt, Rob Guiver and Sean Neary, with McClung grabbing 6th. 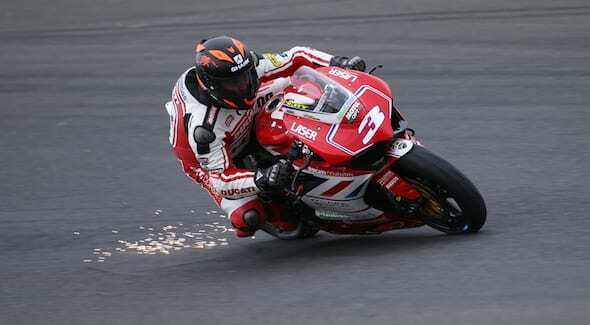 Jon Railton, who traded his 899 Panigale for an old 848 at Knockhill, was 7th. Race two was more of the same, but this time Paul McClung was dicing with the P&H pairing of Hobbs and Morris at the front. 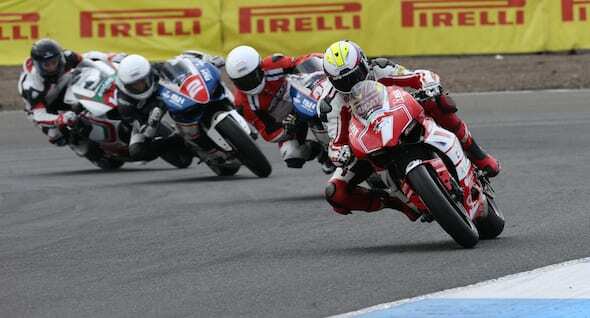 The three were swapping paint in a good-looking race before McClung slung it down the road at Duffus. Hobbs went onto win by a few seconds, from Morris and Marty Nutt. Rob Guiver had a naughty crash in Sunday morning warm-up and missed the second race, as did Sean Neary with bike problems. That bumped Darren Fry up the order to 4th, and me to 9th. Leon Morris then jumped in his car (with the help of a step) and drove back down to the south coast and his heavily pregnant wife. I drove to Glastonbury to catch the last few minutes of Dolly Parton. Morris still leads the TriOptions Cup by 23 points from Hobbs. Next up is Brands Hatch GP on the 18/19/20 July.